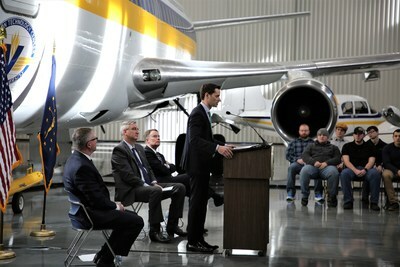 INDIANAPOLIS, Jan. 31, 2019 /PRNewswire/ -- AAR (NYSE: AIR), a global provider of aviation services, and Vincennes University (VU) today announced their new aviation maintenance education and training partnership to further enhance instruction as well as student job experiences and career prospects at AAR upon graduation. AAR's EAGLE Career Pathway program will expand the curriculum of VU's aviation maintenance technology program to include job shadowing and mentoring, as well as academic support and monitoring. VU students who pursue the FAA-certified aircraft mechanic's certificate are eligible for up to $15,000 in tuition reimbursements from AAR. Indiana Gov. Eric Holcomb joined John Holmes, AAR president and CEO, Chuck Johnson, president of Vincennes University, and Indianapolis Mayor Joe Hogsett for the official announcement on Thursday at VU's Aviation Training Center, located at the Indianapolis International Airport. "I'm proud to support this partnership that complements our goal to strengthen our workforce and equip Hoosiers to fill the high-wage, high-demand jobs throughout our state," Gov. Holcomb said. "Together AAR and Vincennes University will help students take their education and skills into a fulfilling career." AAR's partnership with VU is one of many ways the company is connecting students with education and real-world job experience to fill the gaps in aviation for middle skills that do not require a bachelor's degree. There is demand for 189,000 new mechanics in North America through 2037, according to a Boeing study. But aircraft maintenance technicians (AMTs) are already in short supply. "There are significant opportunities for government, business and educators to collaborate to resolve the industry's workforce challenges," Holmes said. "At AAR, we are encouraged by the enthusiasm and support we've received in Indiana and across the Midwest to provide greater access to training for jobs that are available now." VU and the state are pushing to grow Indiana's workforce and are focusing on developing workers for high-priority industries and in-demand, high-paying jobs. Holcomb's Next Level Jobs program is part of the Next Level Jobs Indiana initiative. The multifaceted approach provides reimbursements to Indiana employers for training employees in high-demand fields. The Workforce Ready grants allow Hoosiers to receive tuition-free certificates from VU in flourishing sectors of Indiana's economy, including advanced manufacturing, building and construction, health and life sciences, information technology and business services, and transportation and logistics. VU offers 47 qualifying programs, including two in aviation maintenance technology in Indianapolis. "Vincennes University is proud of the long and successful association we have had with AAR, and with this new announcement we are taking the partnership to the next level," said Johnson of Vincennes. "This program combines a great company in a key industry sector whose economic impact is growing in central Indiana and throughout our state, with VU's tradition of producing the highest quality aviation technicians. Further, we are grateful for the opportunity to help more Hoosiers acquire the training, education and skills they need by leveraging the funds available through the governor's Next Level Jobs program." AAR is a global aerospace and defense aftermarket solutions company that employs more than 6,000 people in more than 20 countries. Headquartered in the Chicago area, AAR supports commercial and government customers through two operating segments: Aviation Services and Expeditionary Services. AAR's Aviation Services include parts supply; OEM solutions; integrated solutions; maintenance, repair, overhaul; and engineering. AAR's Expeditionary Services include mobility systems and composite manufacturing operations. Additional information can be found at www.aarcorp.com.